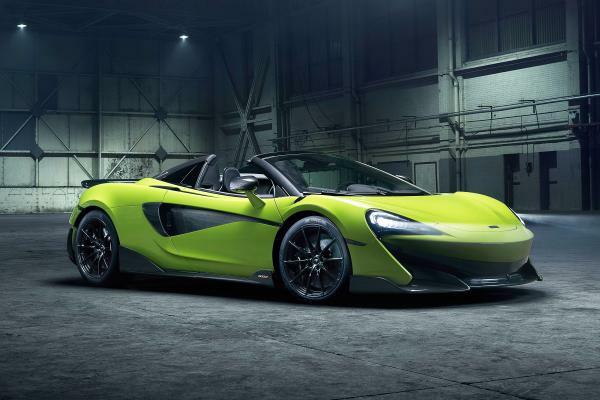 McLaren has revealed the 600LT Spider, the fifth car to carry the Longtail name. Prices for this 592-hp beauty start at $256,500. Just like the coupe, the Spider features a 3.8-liter twin-turbocharged V-8 engine pumping out 457 lb-ft of torque. McLaren estimates the convertible will do 0-60 mph in 2.8 seconds, an identical time to the coupe. Hitting 124 mph should take 8.4 seconds, or 0.2 second slower than the coupe. Top speed is 201 mph with the roof up, or 196 mph with it down. McLaren says the Spider retains the structural rigidity of the coupe thanks to its carbon-fiber MonoCell II chassis. It needs no additional structural strengthening, and therefore is only 110.2 pounds heavier than the coupe for a dry weight of 2,859.4 pounds. Despite the 600LT Spider being a convertible, its fixed rear wing makes the same amount of downforce as the coupe’s: 220.5 pounds at 155 mph. Drivers can operate the three-piece hardtop with the push of a button. It can be raised and lowered at speeds up to 25 mph. There is also a wind deflector that can be adjusted separately from the roof. Open up this deflector and you get to really enjoy the sweet soundtrack coming from the top-exit exhausts. Inside the cabin, the McLaren 600LT Spider features familiar Alcantara trim and carbon-fiber racing seats from the P1 as standard. There are plenty of options, including the MSO Clubsport Pack, which includes Super-Lightweight carbon-fiber racing seats, carbon fiber interior accents, titanium wheel bolts, and gloss visual carbon-fiber front fender vents. This package will set you back a whopping $22,090. On the configurator that is now live, you can choose from 29 exterior paint options and multiple interior color themes. You can also delete the audio and climate control systems if you really want to save weight. All cars are hand-assembled by McLaren in England.